Mom tries to get me to eat a variety of foods and sometimes I even get the kind that probably isn't the healthiest thing, but that pancake filled with sausage on a stick can make a darn good breakfast! Friday I had to get in and get my Flu shot booster. As a reward for putting on a brave face mom took me to the Library afterwards. This obviously isn't your normal farm cow, but instead is the type that is blue and lives in Libraries. He wouldn't even give me a moo. They also had a HUGE blank canvas for me to draw to my heart's content. The didn't think about the fact that I couldn't reach the top 2/3rds of the page. Friday was dad's birthday, so we went to Mimi's first thing Saturday morning (Dec 10th) to have some birthday pastries. Saturday afternoon, I awoke to BobBob's smiling face. He came over to watch me during Mom and Dad's Christmas party. A bunch of my friends dropped by around 4pm. Some even stayed up later than I did! We had a great time running around the house and playing with all my toys. There was even a White Elephant gift exchange for the kids and I ended the night with a couple of new books. For the record, Mom wants it known that she did not steal the Toblerone or instruct anyone to do so, but it did in fact end up in their kitchen after all the guests had left. Sunday was a rather nice day weather wise. Apres my afternoon nap, I tried on dad's belt. It fits! 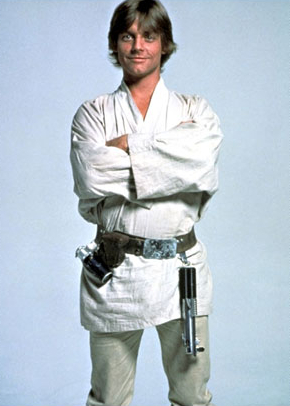 I hear the Luke Skywalker look is coming back this year. Afterwards we hit up CVS where I found this awesome rocking horse, but didn't get the chance to bring him home. I'm definitely putting him on my Christmas list! Sunday night, mom and dad hosted appetizers for a progressive dinner with their church friends. Dinner was at Reverend Carla's house. No other kids to play with, but I enjoyed my rounds with the adults and the chance to play with Carla's granddaughter's toys.